The winter meetings are baseball's version of the small-town carnival that pops up over a random weekend in the summer. There is much anticipation as the carnival sets up shop, the whole town eagerly attends, everyone says hello to each other as they wait in line for some deep-fried dough, it usually rains on Saturday night, and then everybody goes home wondering what all the fuss was about while thinking it's great that we all get together like this. The scenario is set up for Harper to make his free-agent announcement in his hometown. I envision a big gala planned for Monday night, with Harper in a white tuxedo and the Cirque du Soleil cast performing acrobatics in the uniforms of all 30 teams. Alas, don't expect anything so dramatic. According to a recent Yahoo report, the wining and dining of Harper is taking place in Las Vegas -- with a dozen or so teams having already met with Harper or scheduled to meet with him -- but a signing isn't likely this week. Baseball's annual free-agent bazaar continues its slow crawl, as lately we've seen even the top players still unsigned into February. Keep in mind that Scott Boras -- Harper's agent -- had three of the top free agents last offseason, and Eric Hosmer and J.D. Martinez didn't sign until late February, and Jake Arrieta not until March. The Phillies remain the batting favorite for Harper, but as Alex Rodriguez proved in 2001, when he signed with the Rangers, or Robinson Cano showed by going to the Mariners in 2014, you never know how these things will end up. The Dodgers have the money if they want to spend it. Many view the White Sox as a dark horse. The Cardinals could use a left-handed hitter. And don't rule out a return to the Nationals, or the Yankees making their biggest free-agent splash since CC Sabathia and Mark Teixeira in 2009. Speaking of the Phillies, perhaps no team has more pressure to sign Harper -- or Manny Machado, or both -- than they do. When they began their rebuild way back when, the emphasis was on cutting payroll to set up specifically for this offseason. Owner John Middleton said in November that the team might "even be a little bit stupid" about spending money. They've already lost out on Patrick Corbin, so the emphasis is clearly on Harper and Machado. If they get neither? That's the risk. If both players wait to sign, and you hold out in hopes of signing them, maybe the next tier of players -- Michael Brantley, A.J. Pollock, Andrew McCutchen -- is gone before Harper and Machado make their decisions. The Mets made a splashy move in acquiring Edwin Diaz and Cano from the Mariners, but their NL East rivals also have made moves -- Josh Donaldson to the Braves, Corbin and catchers Yan Gomes and Kurt Suzuki to the Nationals, and Jean Segura to the Phillies -- so they haven't necessarily made up any ground yet. They still have holes in the bullpen, maybe center field depending on what you think of Juan Lagares, and are weak at catcher and rotation depth. So they can't stop at Diaz and Cano, and they definitely shouldn't trade Noah Syndergaard if they intend to make a playoff push. That's why the J.T. Realmuto rumors are heating up, although if Brandon Nimmo or Michael Conforto are included in a trade, that opens up a hole in the outfield (remember that Yoenis Cespedes will probably miss half the season after surgery on both heels). Pollock could be a fit in center field, and there are plenty of relievers for Brodie Van Wagenen to spend the Wilpons' money on -- if the Wilpons actually let him spend it. What will the Yankees do? We know they're looking to add another starting pitcher even after acquiring James Paxton, but Corbin grew too expensive for their taste. The next tier of free-agent starters includes Dallas Keuchel, Charlie Morton and J.A. Happ. Any of those signings could certainly happen this week as the Yankees don't want to be left digging in the Matt Harvey pool of starters. 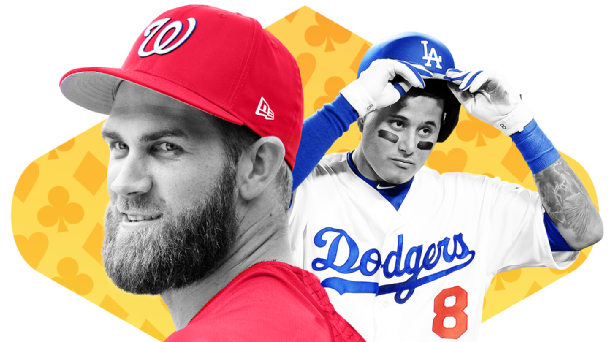 The big question though: Will Machado or Harper end up in pinstripes, and could the Yankees make a thunderous move in Vegas? The Indians signed Carlos Carrasco to an extension a few days ago that will keep him in Cleveland through 2022, with a 2023 team option. The consensus is that that makes it even more likely the front office deals Kluber or Bauer, not just to trim payroll but to pick up some potential impact prospects or young major leaguers. In other words, the Indians feel like they can probably take a minor step back in 2019 and still win the weak AL Central -- and the rotation will still feature a big three, with Mike Clevinger coming off a breakout season. Kluber seems the more likely to get traded as his salary kicks up from $10.7 million in 2018 to $17 million, $17.5 million and $18 million the next three seasons (the latter two are team options). Those salaries are still team-friendly given Kluber's run of five straight 200-inning seasons and a third-place finish in the Cy Young vote in 2018 (after winning it in 2017). The list of potential trade partners begins with teams with strong farm systems, like the Braves, Dodgers and Padres. If there's a major trade that happens during the meetings, this is a good bet to be it. Maybe everyone is waiting for Craig Kimbrel, the big fish in the bullpen market, to sign first, but if he's seeking a six-year deal (as reported), I wouldn't expect him to sign soon. Usually the relievers are the first to start signing, but there has been no movement here outside of Jesse Chavez going to the Rangers. Besides Kimbrel, the top relievers are Adam Ottavino, Andrew Miller, Jeurys Familia, David Robertson, Zach Britton, Kelvin Herrera and World Series hero Joe Kelly. Teams might be a little nervous after some of the shaky results with last year's free-agent relievers -- Bryan Shaw, Greg Holland and Jake McGee all struggled;Brandon Morrow was effective but missed the second half;Pat Neshek got hurt, and so on -- but look for a couple of these guys to go fairly soon. Now that the Diamondbacks have traded Paul Goldschmidt, Greinke certainly can be had, making him the second-best starting pitcher available via trade after Kluber/Bauer. Arizona would have to eat a lot of his remaining contract -- three years, $100 million -- and Greinke has a no-trade clause to 15 teams, making a trade even more difficult to pull off. Jerry Dipoto already has traded Paxton, Diaz, Cano, Segura, Mike Zunino, Alex Colome, Guillermo Heredia, James Pazos and Juan Nicasio -- worth a combined 16.4 WAR in 2018. That doesn't even include the loss of free agents Nelson Cruz and Denard Span, so the Mariners have lost a total of 20 WAR from an 89-win team. The gambler's conceit refers to the notion that gamblers believe they will be able to stop a risky behavior while still engaging in it. The Mariners' best player last season was outfielder Mitch Haniger, worth 6.1 WAR. He's still on the roster. Will he still be on the roster by the end of the week?